IHeartRadio Music Festival Tickets, Two Nights. Friday, Sept 18 and Saturday, Sept 19th. 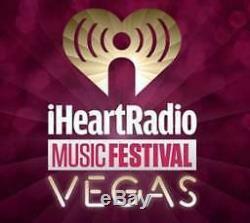 The item "IHeartRadio Music Festival Tickets, Friday and Saturday Night" is in sale since Monday, August 3, 2015. This item is in the category "Entertainment Memorabilia\Music Memorabilia\Country\Concert Memorabilia\Tickets & Stubs". The seller is "bren-tott" and is located in Aiea, Hawaii. This item can be shipped to United States.